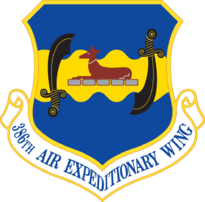 The 386th Fighter-Bomber Group was activated on 8 April 1956 at Bunker Hill AFB, Indiana as part of the 323d Fighter-Bomber Wing. Assigned to the Tactical Air Command, the group had three squadrons, 552d, 553d and 554th. Initially training with North American F-86Fs, these were quickly upgraded to the North American F-86H Sabre and then to the North American F-100A to become proficient in tactical air operations. This unit was literally at the forefront of Operation Southern Watch. For several years following the Persian Gulf War, the base was a sleepy radar site, manned by just a handful of Air Force people monitoring air traffic in the southern Iraq no-fly zone. The 74th Air Control Squadron deployed from August to November 1995 to set up and operate a radar site—the only source of a 24-hour air picture in-theater – as part of Operation Vigilant Sentinel. Exactly one year later, 74th ACS personnel deployed once again, this time for 120 days in support of Southern Watch and Operation Desert Strike.